Ald. 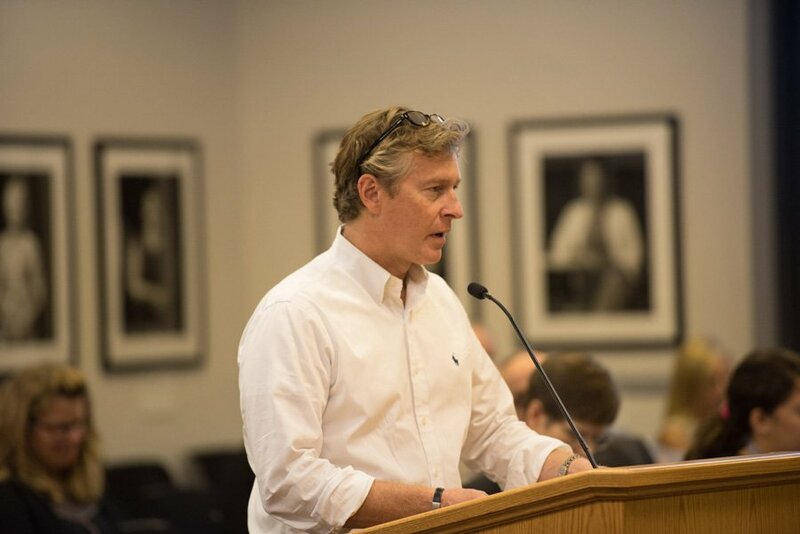 Donald Wilson (4th) speaks at City Council on Monday evening. Council unanimously approved the schematic design for the renovation of the Robert Crown Community Center. City Council unanimously approved the schematic design for the renovation of the Robert Crown Community Center early Tuesday morning. Robert Crown currently houses a variety of recreational facilities, including two ice skating rinks and a full-size gymnasium. The design for the new center includes a renovation of the existing facilities and the addition of a preschool as well as a branch of the Evanston Public Library. A presentation on the design and funding progress for Robert Crown renovations was introduced at the meeting — which began Monday evening — by Marty Lyons, the city’s assistant city manager and chief financial officer, and Andy Tinucci, a principal at Woodhouse Tinucci Architects, the firm overseeing the project. Tinucci said the addition of the library to the community center is unprecedented and that he has only heard of one other instance in which the two entities had been integrated. “The potential for the library to add this aspect of knowledge to a center that’s for the community … creates the potential to weave community and culture (and) create a series of social overlaps,” Tinucci said. Tinucci said the goal of the renovation is to create a “neighborhood landmark” that is accessible to people of all ages and abilities. He said the 700,000-square-foot site will be full of natural light, feature outdoor playing fields and include parkland. The process for designing the new center was “completely open” and ensured citizen input through public meetings with stakeholders and residents of the neighborhood surrounding Robert Crown, Tinucci said. He added that he hopes to begin construction next summer and open the building to the public in fall 2019. But the community discussion surrounding the renovation is still ongoing, Lyons said. The total cost for the design is now estimated between $40 million and $46 million, up from about $30 million in April, Lyons said. Lyons said fundraising efforts — which began in 2015 — are still in progress and are being managed by nonprofit Friends of the Robert Crown Center. To date, about $9.4 million has been pledged in funds — only $600,000 short of the organization’s preliminary fundraising goal, Lyons said. Council was asked to consider using the city’s parking fund to pay for the parking lot and using the sewer fund to pay for site work involving water drainage, Lyons said. The money, along with bond financing to help with construction, would supplement any dollars raised, he added. Ald. Donald Wilson (4th), whose ward includes Robert Crown, told The Daily in April that he supported the rehabilitation of the center because of its “state of deterioration.” At Monday’s council meeting, he said he was happy with the progression of the project.